Morning: I’m not much of a morning person, so getting out of bed usually takes so long that I don’t have much time left for a complicated beauty routine! I clean my face with Bioderma Crealine on a cotton pad and use an eye cream and moisturiser with SPF. I lived in Australia for ages and so I’m hyper aware of sun damage. I like using natural products from brands like Grown Alchemist. I also have an Australian friend in Berlin who makes beautiful botanical face oils called Neighbourhood Botanicals. I recently started taking omega 3 fish oil tablets and probiotics, which have really improved my skin. Inner beauty, right?! Day: I’m actually not very good at make up – I went through a serious Avril Lavigne phase in my early teens involving a lot of bad clothes and dodgy eyeliner and I think it scared me off. Doing modelling, you have a lot of make up put on you, so outside of work it’s nice to let your skin breathe a bit, and also just feel like yourself. My beauty vice is MAC eyebrow gel; it’s a serious habit. For me, it’s the equivalent to a bra for my eyebrows – they’re too big to go without. I normally wake up with crazy devil brows, so it helps tame them. My mum, who hardly wears any make up, gives me a new tube every birthday and Christmas and always asks why on earth I’m so obsessed with it. This usually means I end up gelling my brothers’ eyebrows to show her how effective it is, and then they complain that their eyebrows are crispy and gelled. I also carry Eve Lom “kiss mix” lip balm because it’s a lovely formula and has a cute name. Night: When I do wear make up I like to layer on some mascara. Diorshow is my favourite, as it has a decadently large wand and makes your lashes nice and thick. I love crazy lipstick like Mac’s “Cyber”, a dark purple-black that probably is a chic hangover from my Avril days. I also love classic matte red from Nars or Mac (Ruby Woo and Lady Danger mixed is the best shade) I read somewhere that the average woman eats about 2kg of lipstick in her lifetime, so it might as well be fun colours! This is the cheesiest thing ever but I think the best beauty weapon is a big smile. People who look happy rarely look ugly. That said, although money can’t buy happiness, the really expensive masks from SK II and La Mer seem to have a similar effect. Le rapport entre bonheur et beauté ? On peut citer des bataillons de femmes aussi malheureuses que belles, de Marilyn Monroe à Romy Schneider. Pas trop de règles dans le domaine. Ceci dit, les références de produits sont intéressantes. Georgia is gorgeous! MAC eyebrow gel is the one thing in my make up bag that I couldn’t live without. Does Georgia use the clear one or a tinted one? your PICTURES they are the ones that catch me. I´m bait for your beautiful images, they make me want to read about the person, even if she is not relevant. 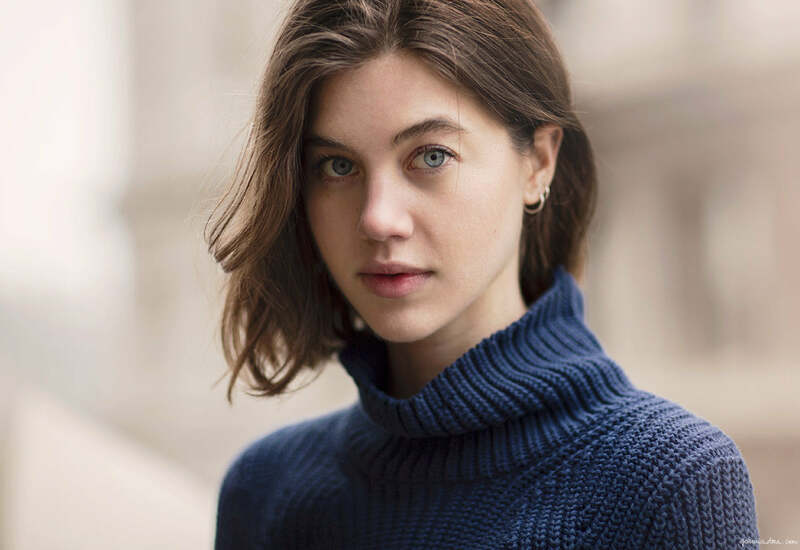 She is a lovely natural beauty, and that sweater is the perfect color for her eyes. I second Bioderma Créaline, which I learned about right here! Forever grateful to you, Garance. Beautiful. Also, the sweater! Where is it from? natural is the best makeup! “This is the cheesiest thing ever but I think the best beauty weapon is a big smile. People who look happy rarely look ugly. ” That is so true. Smile is always the best beauty weapon.